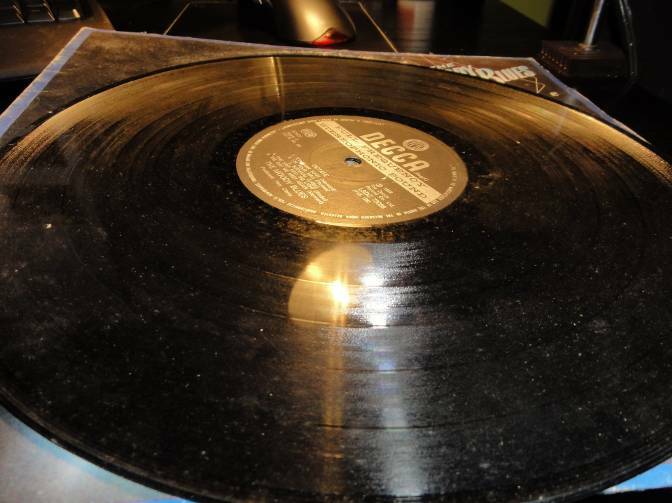 Vinyl record is a medium for storing and playing music. It does not serve to fill up the shelves and when assessing the value and preservation we always looking into a condition of the record itself. Poor preserved records with well preserved cover has absolutely no value. This guide will serve primarily retailers to estimates the state of the records that they sell so that does not happen that a garbage record is sold as “well-preserved” (as it often happens). The records are graded with the numbers 0-10 or with a descriptive English labels (Mint, Excellent, Good), where the score 0-2 gives to that due to the damage is such that it’s worthless, to 10, which is considered to be one that is preserved like new. Lack of protective nylon or protective paper further diminish the value. Vinyl records with a score 0-2 are not for use and sale, they are not worth anything. 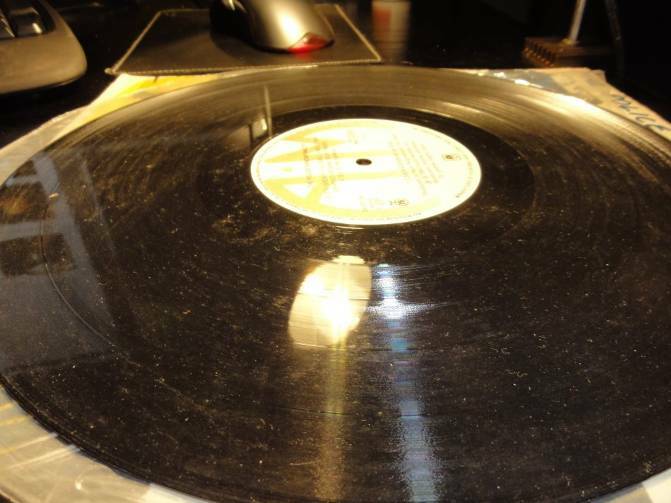 Record may be in good condition, but greasy due to fingerprints or dirty. Such records can be washed with special washing machines or by hand, but this is a process that lasts and that costs money, and it reduces the value of a record. It is important that you know to grade a value of a record by yourself so that the buyer would not have felt cheated, but also that you won’t be cheated by a seller or a buyer-reseller. 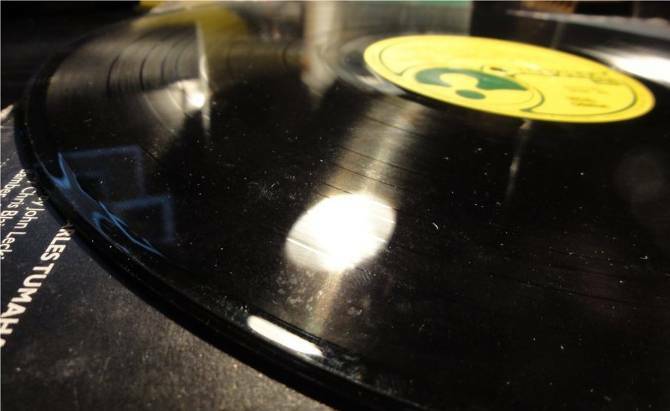 Remember that vinyl record serves to reproduce music, so any damage, fat, soil or distortion significantly degrade the quality of reproduced music and therefore its value. 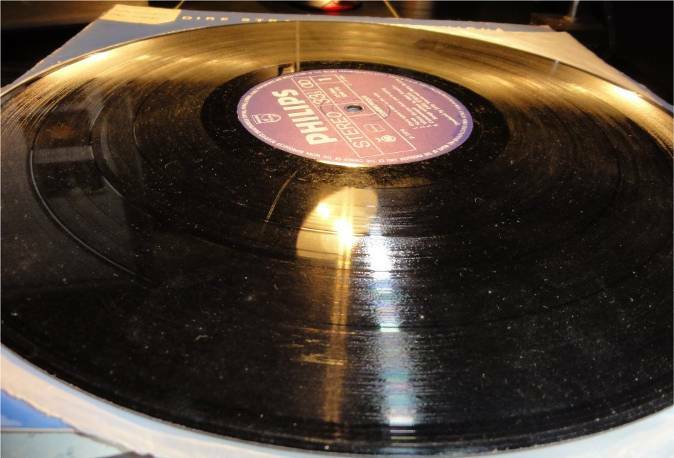 Vinyl, the material from which records are made is an imperfect material and it does not take much to destroy it. Cover and records are assessed independently; better combination is when a record is in better state than the cover, though, as a rule, there is rarely a bad preserved cover with a well-preserved record inside. If the owner did not take care of the cover, it is difficult to believe that he/she has take care of the record. For visual evaluation of the records take the record in hand (keep it around the perimeter and central label) and “shines” is the source of light, the best close to the bulb (as in the pictures). Move it back and forth, up and down, until you review the entire surface. Descriptions and evaluation is described according to the Goldmine Grading Standard. Perfect condition! This record looks like new from the store, without any damages, as if never used, really never used, or is played only a few times. No prints, scratches, a small amount of visible dust is allowed (even new it may have some dust). COVER: no label shops or hand-printed text. Preserved as new. In short – a perfectly preserved specimen. This record is new out of the pack, without any reproduction. Static electricity is attracted dust. A similar situation as the score 10. The record must be also perfect, as new, small number of times played. 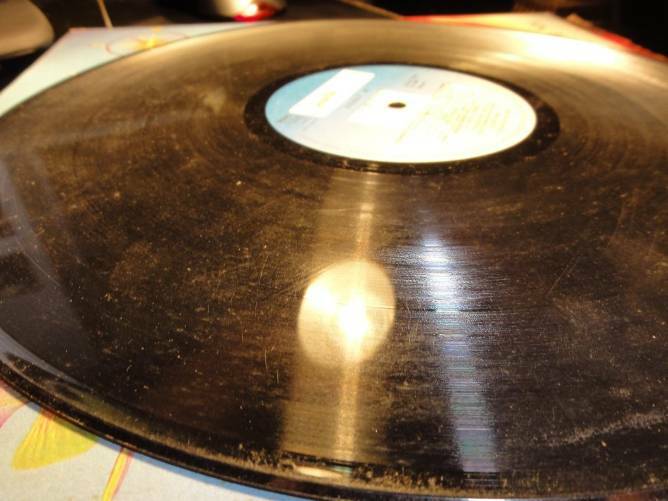 The condition of the record is as shown in a Mint condition picture. The only permissible deviation from estimates 10 are the shops label or barely visible signs of cover handling. This record looks like new. It is allowed to have subtly few fingerprints on the surface of the record. They are such that they are difficult to see. When you play it you don’t hear any noise created by these prints. COVER: preserved almost perfectly with little indication of age and use. Near Mint record – barely visible footprints around the perimeter, there is dust that is easily removed by a brush for this purpose. Without any and smallest scratches. Visible prints, more than a few pieces. Without any scratches on the record. COVER: very well preserved with palpable traces of use – barely visible “ring” from the record is allowed. The corners of the cover a little bit damaged, but not bent and torn. Cover has no other major damage, handwritten text, tape or other “extras” that does not exist in the factory pack. Visible fingerprints, dust can be easily removed with a brush, without any scratches. On the record are seen footprints and shallow surface scratches. The record works very well preserved, but with the naked eye there are visible scratches. If those scratches do not affect the sound (no sound is “crunch”), then the board is graded VG +. COVER: clean, with no major damage, allowed a pair of hand signs (price, date and place of purchase, the name of the owner, the number of personal collections). White cover may have a yellowish tint, without damage from moisture or water. The corners can be bent, but not torn, all the pictures and inscriptions must be completely visible. VG + cover has no more than 3 counted lacks. Visible fingerprints and present minor, superficial scratches that do not affect the sound. In this instance traces of washing (probably water + liquid detergent) and prints at the very edge. Quality washing can remove these lacks. The value of this instance is 20% of the NM-preserved specimen. For example, if NM is 10 €, this copy costs 2 €. Proper cleaning and washing rises the value to 25% NM instance or to a maximum of € 2.5. This record is in a state that is not perfectly preserved, but when playing it sounds very well. Little noise or “crunch” can be heard. The dynamics of the sound must be contained and it is such that is louder than the noise. COVER of the record in VG condition looks very good. It is allowed to see the “ring” of the record, there are signs as in VG + (without huge letters, without using thick markers) that cover looks like a used and to eventually see parts of packages that have adhesive, separated. If the surface of the cover, pictures and inscriptions on touch has the effect of dust (as he fell to the snow cover), then cover has a rating of less than VG. Cover can be yellowish in color because of the way of storage, or because of tobacco smoke. Exists scratches that we can see and hear, but record reserved the dynamics of sound. The value of this instance is 10% of the NM-preserved specimen (more visible scratches by the letter P by Philips, otherwise 15%). Dusty, but evidently VG condition. The value of this instance is at most 10% of the NM-preserved specimen (need washing and wiping with anti-static brush). For example, if Nm is 10 €, this copy can cost up to 1 €. 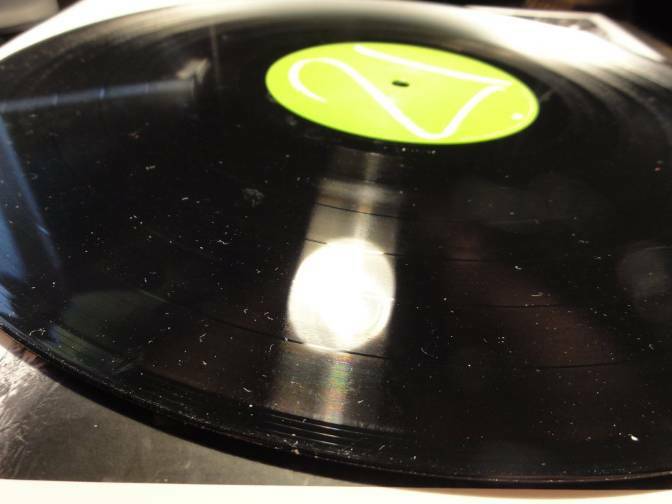 Good record looks as often listened, with noticeable scratches or fingerprints, without the gloss of the new board. However, it still can be heard, along with a noticeable noise. There is a noticeable loss of dynamics due to use. It should not skip or reproduce the same groove, not to have a loud cracking as deep trace of damage. When listening to all these shortcomings should not affect the enjoyment of music, although you can hear background noise. Washing can fix the sound and reduce noise, but can not exceed to the category VG. COVER of a G condition record looks used in every sense. Torn cover, assembled with tape (not opaque), can have labels, pencil or marker, but not in capital letters. Packs can have a look “dirty”, hard-to-read labels. If the inscriptions can not be read, then cover has a rating of “poor”, and as such – worthless. Record of G + grade. Washing is improving the situation, but can not exceed in VG grade. The value of this instance is 7-10% of the NM-preserved specimen. Visibly used record. Washing is improving the situation, but can not exceed in VG grade. The value of this instance is 3-6 % of the NM-preserved specimen. For example, if Nm is 10 €, this copy will cost 0.3 to 0.6 €. The value of this specimen is about 1-3% of the NM-preserved specimen. Particular copy is on the border with Poor preserved (no value) which can be determined only with a playback. For example, if Nm is 10 €, this copy will cost 0.1 to 0.3 €. 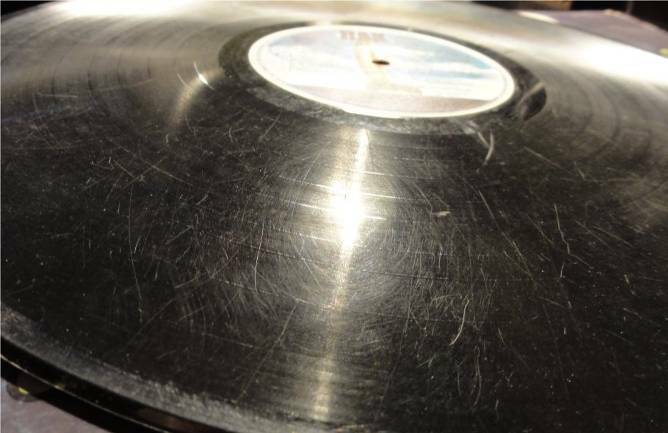 Record with a grades 1-2 are heavily damaged boards, hard listenable, with strong noise and “crackling”, such that with a washing we can not fix a record condition, very dirty, unpreserved, without dynamic sound, with the naked eye visible numerous scratches, often without protection paper or nylon. You do not need a record player to grade this record with the naked eye as bad (see image). These records are of no value, just garbage. If you selling such a records, expect to get a bad score, and attribute a “con”. By selling these records you made a problem for all. 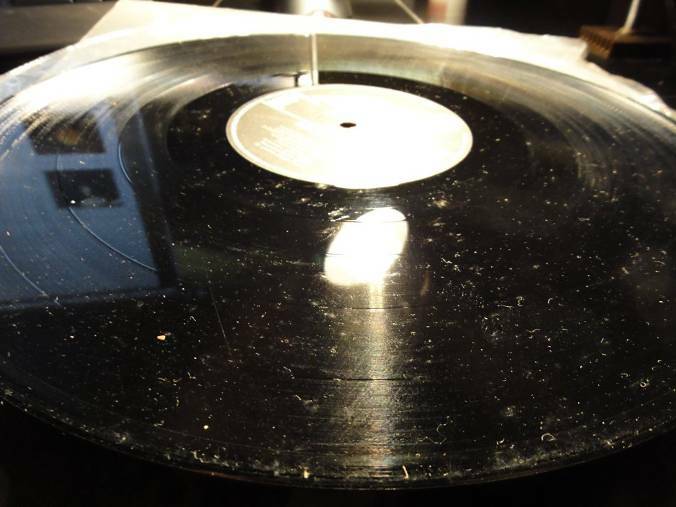 COVER of a poor graded record is a cover that is decomposed, not holding plate, damaged files, illegible part or all of the text, the harder it is damaged by moisture or water or torn so that missing parts. 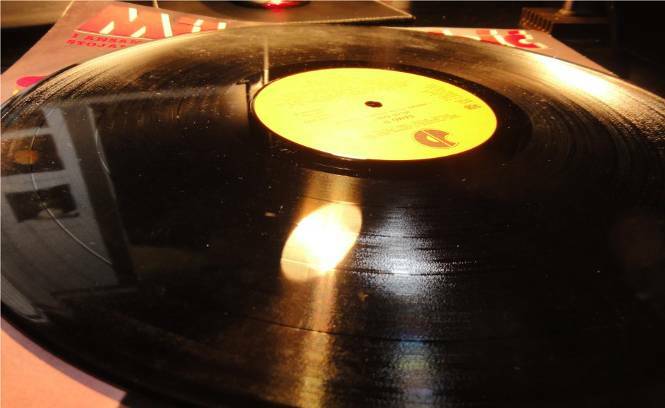 The poor condition of the record, record due to the damage is not for any use. It’s amazing that people sell this, and even called them “well-preserved”, but all is possible today. Sellers of such record should not only be avoided, but should be marked and give others know to avoid them. Sellers of these records are a fraud and sale goods by mail. 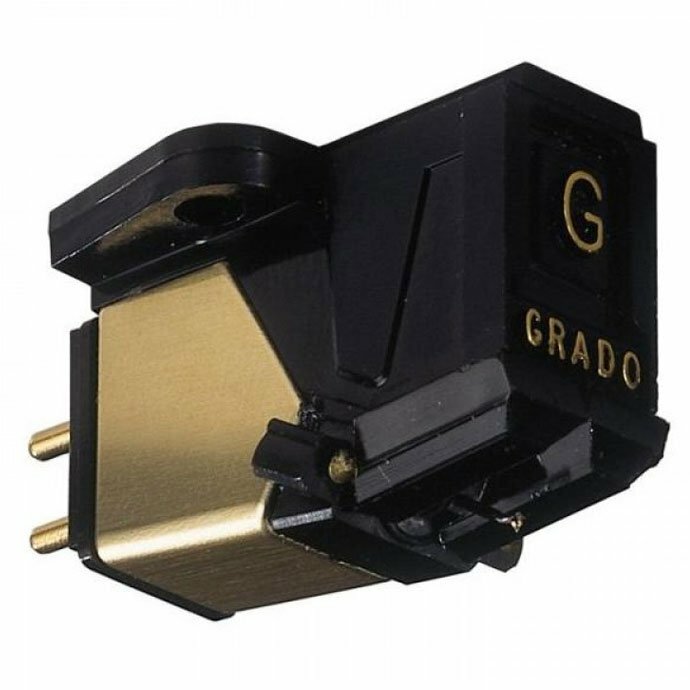 Such sellers are identified by what they say usually (but not exclusively) “do not have a record player to try them”, “they do not understand in this”, “else we examined them,” “visually work well” and the like. Avoid these. 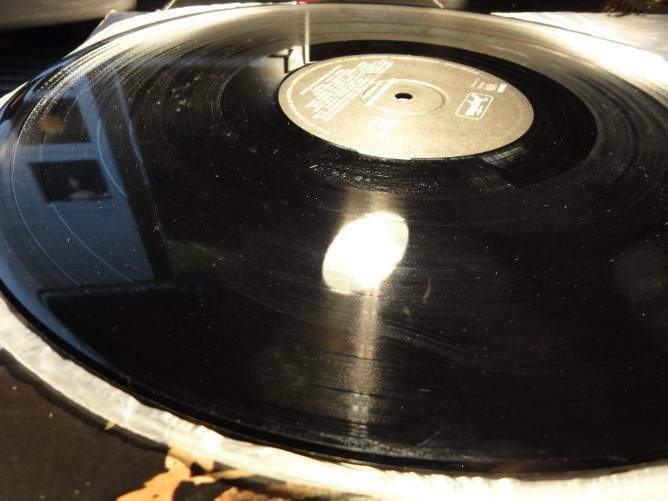 These records are those with severe disabilities, such that the needle is very likely to break (and they cost from 50 to 500 €, so you see what can happen after that), with deep furrows, intentionally damaged, bended, with glue on the surface, lime, glued part of the cover(no protective nylon, and due to the effects of moisture cover is “glued” to the record). Usually cause permanent damage of the needle. Note that except they have no value, they make a big damage. Do yourself and the world a favor and immediately toss them in the trash. You will not get rich by selling such records to someone for half € piece. All written mostly applies to those records with grades 1-2. These records may be only in the personal collections where it is a very old or great rarity record, but that is only for showing and not for listening.